It’s true what they say about grandchildren: they really are the reward for surviving parenting. They also provide an excellent excuse to make the best sort of messes, especially over the holidays when the focus can sometimes lean towards perfecting the season. 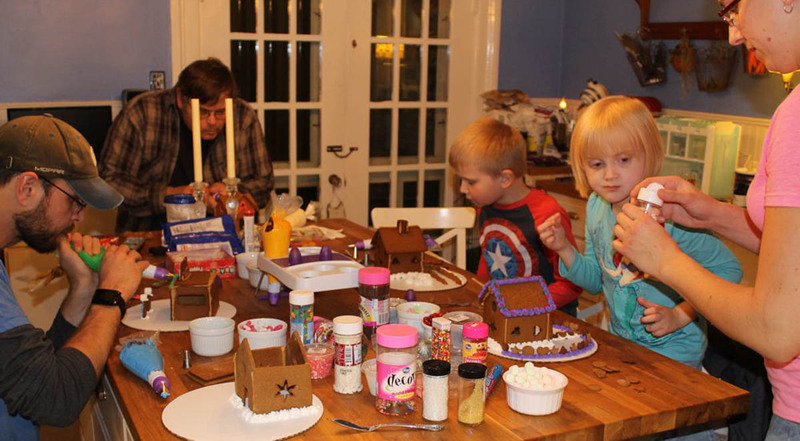 For the Ferrier clan, gingerbread house building has become a seasonal favorite. We start with a double batch of gingerbread dough and basic house cookie cutters. It didn’t take my creative crew very long to start making design changes, though, for truly personalized houses. It’s a team effort. As the first house bakes, the next is planned and cut out. It’s hard not to notice that the houses tend to get more complicated as we go along. 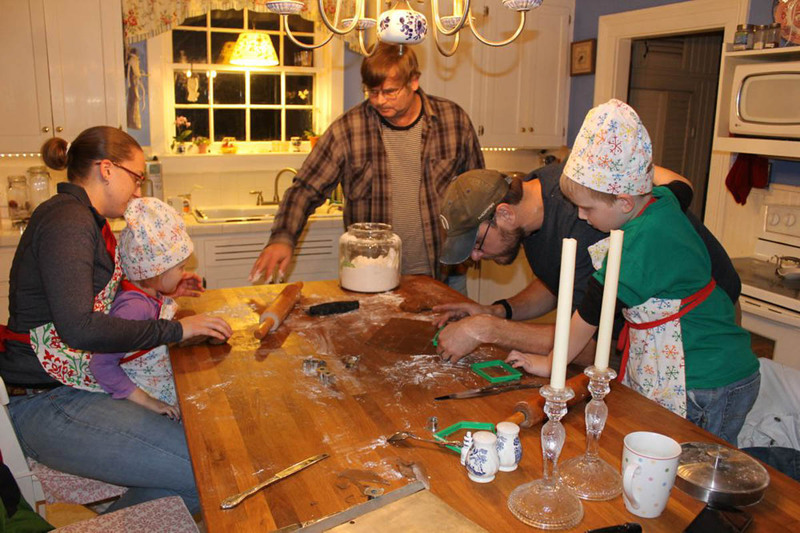 Left over dough gets turned into extra gables and chimneys, and props to set the scene, such as doors and shutters, stepping stones and even house guests and gas pumps. The very best sort of pandemonium begins when the icing appears, along with sprinkles and candies galore. Since we’ve started building gingerbread houses, I’m always on the lookout for interesting shapes and patterns in the candy aisle. It’s even more fun when it’s used for something I never considered. We started building the houses to create a new tradition with our grandchildren, but it’s turned out to be fun for all of us. It’s also turned out to be a wonderfully creative and even artistic adventure for us all. It’s easy to set in with a goal in mind only to have the cookies have the last laugh. It’s taught lessons on accepting defeat on perfectionism and snatching victory for character and charm. 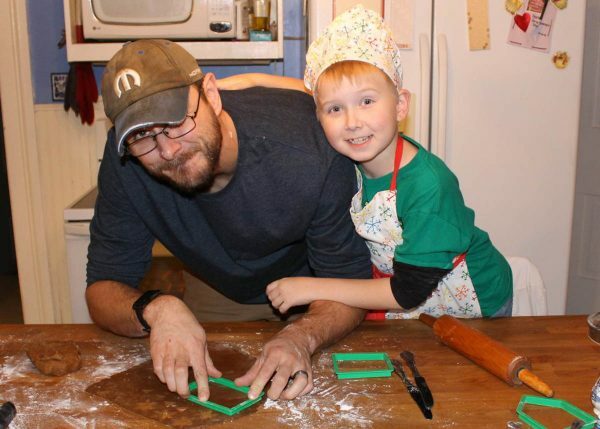 For your own gingerbread house building adventure, here are some links to a similar cookie cutter set and recipes we have been using. I make it doubled and make 2-4 batches depending on the size of the crew. Happy Holidays from Beth Ferrier at Beth Quilts. 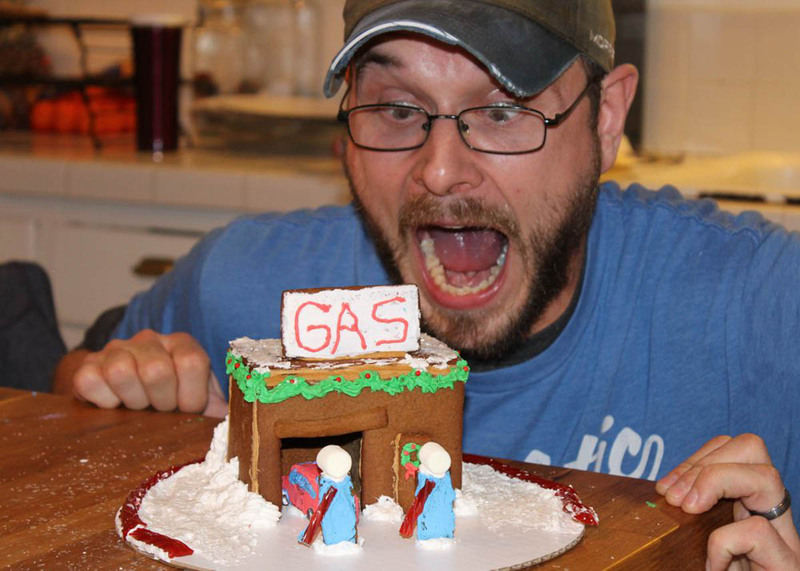 What would be your favorite decoration for your gingerbread house? A winner will be chosen at random on December 21, 2015 and announced later this week! 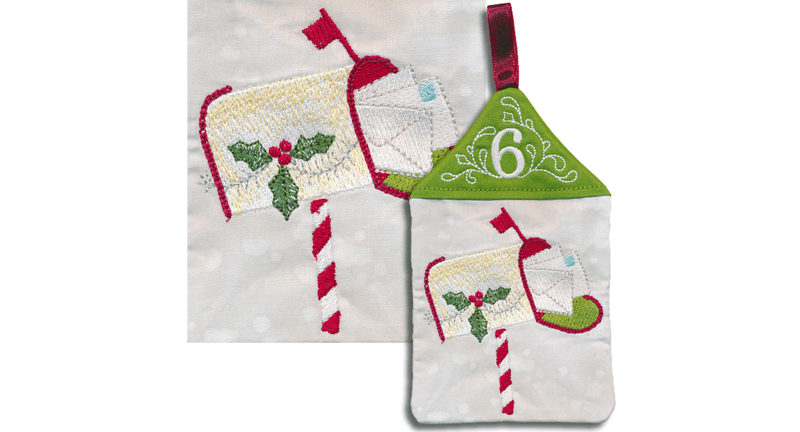 Congratulations to our WeAllSew reader “swalter47”, the winner of the December 20 gift. Enjoy! Lots of M & M’s! The icing. Our family has done some cookie painting and we love to get creative with icing tips and colors. I would make Doctor Who’s Tardis so he could travel around to the candy planets! Our grandchildren seem to like red imperials the best then gun drops. However I must add only about half actually end up as part of the gingerbread house. Love to use peppermints and redhots – so fun to see everyone involved. Gum drops were always my favorite part! Love Vanilla Wafers for roofing. If an extra piece of chocolate happens to stick to it…Whoops!!! My favourite decorations for ginger bread houses are the red and white Christmas peppermint candies. So festive! Thanks! I would like to create a manger scene and put a tiny doll in it for the baby Jesus. My favorite decoration on a gingerbread house are colored M & Ms.
Great houses, I have never made a gingerbread house so I’m not sure what my favorite decoration would be. Thanks for sharing the pictures, it looks like a lot of fun. May have to try this when my 7 month old grandson gets a little older. I like using edible toppings that look like stones for a walkway. In our house gingerbread houses were always made at Halloween for a haunted gingerbread house. Caramelized sugar “glass” for the windows. I would use a Christmas tree shape as well as holly berry designs. I have never made a gingerbread house, but have seen some that use spiced cookie wafers as roofing shingles. I love a good spice cookie! I would make flower garlands to decorate the house. My favorite are the peppermint circles and the icing….can’t go wrong with icing!!! I like using Necco wafers on the roof top. Brings back memories of doing this with my kids! I have always loved the Silver Dragees but they don’t sell them anymore. I would put a snowman in the front yard. I would make royal icing flowers in advance to fill window boxes. I’ve never made a gingerbread house. It looks like fun making gingerbread houses. I think I would use some different types of Christmas candy. The gingerbread house windows should really glow with a bright yellow. I love candy cane fences. Thanks for the chance to win! A big bag of brightly colored candies, enough to sort by color. My favorite decoration is the red hot candies. lots of M&M’s…. I love them…..! Lots of Great Frosting, mini marshmallows and Red Hots. Peppermint candies to make whirlygig decorations. I would use lots of icing to give texture to the roof, walls and window frames. I love the little beaded candies found in the allsorts. If only they sold them separately. Oooh – delicious marshmallows for snow, icing for writing and swags, Smarties for doorknobs and chocolate for a roof! My gingerbread train was a disaster. I do not think I am brave enough to attempt a second one. I would love to use gumdrops. My grandson added a birdhouse on a pole…..fruit loop on a pretzel stick; a bonfire made of pretzel sticks stacked in a circular formation with red frosting and red hots in the middle; pretzel sticks with mimic marshmallows on the ends, and you have winter camping outside the gingerbread cabin! I started making gingerbread houses with my son when he was in cub scouts. We made them out of graham crackers the first year and the kids had a blast. We then began having a Gingerbread House Party every year the week before Christmas. The kids would invite all of their friends over and the parents were free to finish up Christmas shopping or wrap presents or just take a break from the kids for a few hours. We’d order pizza and when the houses were all finished and the kids were eating pizza, the older ones would put on a karaoke show for the younger ones. At last count, we had 22 kids over. My husband and I would bake all the houses ahead of time, thanks to an iron mold that my father had given me, and the kids would each have to bring over a bag of candy. We’d put it out in bowls on the tables and then we’d be running around with pastry bags full of royal icing, placing it on the houses where the kids instructed. My kids are all grown now with children of their own and scattered across the country, but I sure do miss those days!